What is Stainless Steel Investment Casting? Some of the products are of strange shape and cannot be produced by techniques such as pipe bending when producing stainless steel products. In order to produce such products with irregular shape (hollow or solid inside), a stainless steel casting process of filling and forming with wax mould, sand mould and liquid material is adopted. Such process is called stainless steel investment casting. Advantage: Can make a variety of products according to different wax models. Disadvantage: The precision of the blank is low and the surface roughness is relatively high. 1. Mold according to different shapes of products. The mould is divided into upper and lower concave die and completed through turn-milling, plane milling, milling, etching, electric spark and other comprehensive processes. The shape and size of the pit are consistent with the half edge of the product. Because wax mould is mainly used for industrial wax pressing, the aluminum alloy material with low melting point, low hardness, low requirement, low price and light weight is selected to make the mould. 2. Use aluminum alloy mould to produce a large number of industrial wax real core models. Under normal circumstances, an industrial wax real core model can only correspond to one blank product. 3. Fine repair the residual around the wax mould. After deburring, a plurality of single wax molds is attached to the pre-prepared mould head (also known as group tree), which is also an industrial wax real core model produced by wax molds (The outline looks like a tree). 4. Spray the first layer of fine sand (A kind of fireproof sand with high temperature resistant feature, we usually use silica sand) uniformly after applying industrial glue to the wax molds that have been fixed on the die head. 5. The wax mould with the first layer of fine sand is naturally air-dried at the set temperature (or at constant temperature), but the shape of the wax mould inside cannot be affected. The natural drying time depends on the complexity of the product itself. 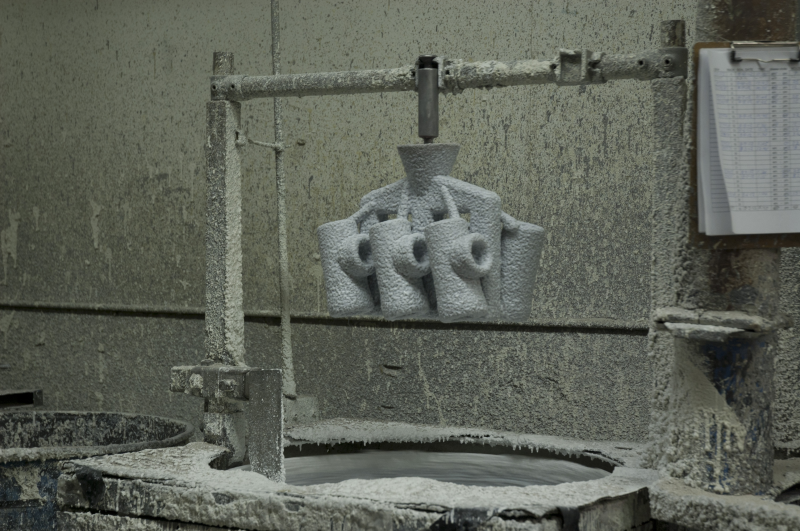 Generally, the first air-drying time of precision casting is about 5-8 hours. 6. Continue to put industrial glue (silica soluble slurry) on the wax mold surface and spray the second layer of sand after the first sand spraying and natural air drying. The second layer of sand is larger and thicker than the previous one. After spraying the second layer of sand, the wax mold will dry naturally under the set temperature. 7. After the second sand spraying and natural air drying, conduct the third, the fourth and the fifth sand spraying and other processes. Requirements: Adjust sand spraying times according to the product surface requirements, volume size, self-weight and others. In general, sand spraying times are 3-7 times. The size of sand particles is different in each sandblasting process. Usually, the sand particles in the later process are thicker than those in the previous process, and the time of air drying is also different. The production period of sand on a complete wax mould is about 3~4 days generally. 8. Apply a layer of white industrial latex (silica slurry) evenly for bonding and solidifying the sand mold and sealing the wax mold to prepare for the later baking process. It can also improve the brittleness of the sand mold, so as to break the sand layer and take out the blank after the baking process. 9. Baking process: Heat the wax mould fixed on the die head and completed the sandblasting and air drying process in a special metal closed oven (usually a steam furnace for burning kerosene). For industrial wax melting point is not high, the temperature at about 150゜, wax mould is dissolved by heat to form wax water flowing along the gate, this process is called dewaxing. The dewaxed wax mould is just an empty sand shell. The key to precision casting is to use the empty sand shell (Generally, this kind of wax can be used repeatedly for many times, but these wax must be re-filtered, otherwise, the dirty wax will affect the surface quality of the blank, such as: surface sand holes, hemp spots, and will affect the shrinkage rate of the precision casting products at the same time). 10. Baking sand shell: Before pouring into the stainless steel water, you must bake sand shell, usually roasted at high temperature furnace (temperature is about 1000゜) to make the waxed sand shell more solid and stable. 11. Pour the molten stainless steel water into the dewaxed sand shell. Liquid stainless steel water fills the space in which the wax mold was formed until it was fully filled, including the middle die head. 12. The factory must check the percentage of the material because of the mixed material of different components in the dissolved stainless steel boiler. Then adjust to the required ratio, such as adding aspect elements to achieve the desired effect. 13. After the liquid stainless steel is cooled and solidified, the outermost sand shell is broken by means of mechanical tools or manpower to reveal the solid stainless steel product, which is the original wax model shape, that is, the final required blank. Then cut, separate and roughed into a single blank. 14. Inspecting blank: The surface of blank with sand holes and air holes must be repair welding by argon arc. Serious defect blank is cleaned as waste and returned to bake again. CFS Foundry is a comprehensive company involved in both stainless steel casting and post machining. With casting experience more than 30 years, we are able to produce stainless steel components ranging from 0.02kg-50kg by stainless steel investment casting process. Currently, all our stainless steel investment castings are mainly exported to USA, UK, Canada, Australia, South Africa, ect. Thanks to our high quality and comprehensive service, we have achieved good reputation from our customers. Moulding: All the moulds developed in CFS are automatic, although the tooling cost is a bit higher, the production efficiency is higher. What’s more, we can control general casting tolerance within ISO 8062 CT5. Casting: Can produce stainless steel investment castings with all types of stainless steel grades, for example, SS304(L), SS316(L), CG8M, PH17-4, 2205 duplex stainless steel, ect. Machining: Our in-house machining can meet a variety of machining requirement, such as drilling, milling, boring, cnc machining, ect. Our machining capability can help our customers to receive finished components directly with less lead time. More important is that cost can be saved compared with some outsourced companies. Surface Finish: To meet different demands of surface finish, CFS Company can provide different types of surface treatments, like shot blasting, sand blasting, vibratory polishing, mirror polishing, ect. Any interest on cooperating with our company for your stainless steel investment casting project? Pls contact us or email cathy.sales02@gmail.com directly, we will go back to you within 12 hours! We are interested in ordering from 100 to 500 pcs (it depends on price) of stainless steel investment castings. The surface needs to be mirror polished. I would be grateful for preparing an offer for us including transport costs to Poland. Thanks for your message! We are professional in manufacturing stainless steel investment castings, and are able to do mirror polishing after casting. To proceed, could you pls send the drawing to cathy.sales02@gmail.com. Then our engineer will evaluate the drawing and offer you our best price first. We developed and would like to manufacture a new part in stainless steel investment casting. We need a strong material with a high ultimate tensile strength (>550MPa) as well as high fatigue strength (>250MPa). We have been looking into CG8M as a material – do you offer this? It is important that it is nonmagnetic. Or, do you offer heat-treatments or the like to make materials even stronger? Yes, we can make stainless steel investment castings with CG8M. For heat treatment, we suggest solution treatment to make the products stronger. Could you pls first send us the drawing，so that we can discuss in detail?